STS-116 Mission Specialists Robert Curbeam and Christer Fuglesang completed their scheduled electrical work and are now concentrating on other spacewalking tasks. Shortly after the start of the spacewalk at 2:41 p.m. EST, Curbeam and Fuglesang began STS-116’s work to rearrange the International Space Station’s power system from a temporary status to a permanent setup by rewiring two of the station’s four power channels. Systems were powered up at 4:45 p.m. following the completion of the electrical work. The remaining two channels will be rewired during the mission’s third spacewalk, slated for Saturday. The STS-116 crew is performing the electrical work to bring power generated by the P4 solar arrays on line for use by the station’s systems and prepare for more arrays to be added next year. 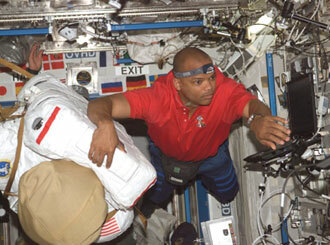 Curbeam and Fuglesang are now focusing on the relocation of two crew equipment translation aid carts. This will clear the way for the station’s mobile transporter rail car to move down the station’s rail system to the S1 truss at a later date in preparation for the STS-117 mission next spring. Bangladeshi economist Muhammed Yunus called poverty a fundamental threat to peace as he accepted the Nobel Peace Prize in Oslo, Norway. Lisa Bryant has more on the awards ceremony for VOA from Paris. Sixty six-year-old Mohammed Yunus – the economist from Bangladesh, whom many call the banker of the poor – and his Grameen Bank were awarded the prize for helping millions of people get out of poverty through micro-credit loans. The Nobel committee called Yunus a “modern Ghandi,” as it bestowed the prize on the micro-credit pioneer. Yunus says he will use his share of the $1.4-million award to create a company making low-cost, high-nutrition food for the poor. … 2006 has been a busy year of events, publishing, clients and pro bono engagements. My new book WOMBAT Selling: How To Sell By Word of Mouth (Hardie Grant) is selling well with another one on the way. If you’d like some holiday reading you can download a copy here with my compliments. There have been some great clients and events this year including the AMP Offshore in Amsterdam; CPA Conference in Brisbane; Masterclasses at the Melbourne Exhibition Centre; Australia Post; Fernwood; Flight Centre; Think Appliances; Telstra and Aussie Bodies plus pro bono engagements for Melbourne Grammar School, Marie Stopes International in Sri Lanka; Yellow Ribbon; Lord Somers Camp and Victoria University. In November, the School of Thinking celebrated its 27th Anniversary and ‘Thinking’ is now on the curriculum in Victorian schools and other states are about to follow. Also, planning has begun for the World Thinking Congress which we will host in the new 5000 seat Melbourne Convention Centre and the date is set for August 2010. May I say thank you for your interest in my work and I do wish you a very happy and peaceful holiday season with a bright and productive new year for you in 2007. I also look forward to seeing you if you are attending the 20th MEA National Conference in April 2007, Hobart, where I will be a keynote speaker.  Themes, Topics, Conferences, Seminars, Speaker, Trainer, Thinker, MC, Guru, Coach. THINK  Lateral Thinking; Creative Thinking; Innovation; Stretegic Thinking. LEAD  Strategy vs Tactics; Training Trainers; Succession; Chivalry; Philanthropy.